"laboring in love" for her family. Now, I have more reasons to enjoy this drink as I begin baking and enjoying all these wonderful recipes that include eggnog too. P.S. Grammie I shall carry on your traditions and always keep your spirit alive. I shall love you forever and hope to bring honor to your name. Front Cover: Picture of our newest addition to the family. He is our male Schnoodle named Paczki (Punch-key). He and his sister Tibby love Eggnog too. I So Agree... And Your Friends are Very Lucky to have a Friend like you!!! You are Very Creative and from My Perception an "All Out Pro at Entertaining"!!!.. Totally AWESOME!!!! Thank you Melissa, I look forward to trying your eggnog cake. I slowly have been trying the recipes from the cookbook. I think I have about 20 of them made so far and only 30 more to go...give or take a little. lol....love my Eggnog! Kim, it is a awesome book! Thank you for including one of my recipe. 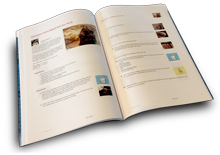 Thanks Christine, I am glad you enjoyed browsing through the cookbook.